Do this if you want a fresh start, or if you're selling or recycling your PC. There are two main reasons why you might want to reset Windows 10 and remove everything. One is if a program or setting really screwed up your PC—like that never happens—and you just need to start over. Another is if you plan to sell or recycle your PC, and you want to make sure the next person doesn’t get any of your stuff. Luckily, Windows 10 lets you start over with a few clicks. 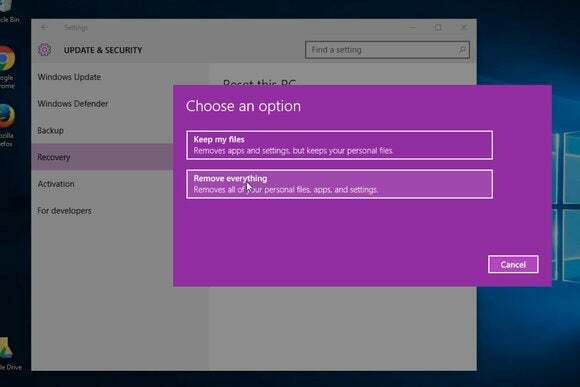 I’m going to show you how Windows 10 lets you reset your PC and remove everything—and I mean everything: all of your files, software, and settings. Just make sure you really want to burn the place down before you do it, because this is it. 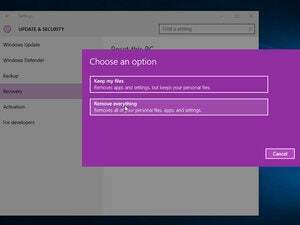 If you have any doubts, back up your PC or important files before you do this, or choose the milder reset option, which resets just Windows and keeps everything else. Ready? Okay. Hit the Start button and go to Settings. In Settings, select Update and Security, and in there, select Recovery. At the top of the Recovery section you’ll see Reset this PC. Click the Get Started button—don’t worry, you’ve still got one more step—and then you get to choose an option. In this case, we’re choosing Remove everything, and the dialog box reminds you one more time that this really means everything. Then you just sit back and let Windows do its thing. It may take a while. When it’s done, you should have a fresh Windows installation with nothing else. Just note that if your PC came with a bunch of preinstalled “bonus” programs, aka bloatware, from the vendor, those programs will reinstall themselves as part of this process. If you want to get rid of bloatware, you’ll need to do that manually.